We’re waving goodbye to another school year, which means lots of book-release parties and other fun events around here. 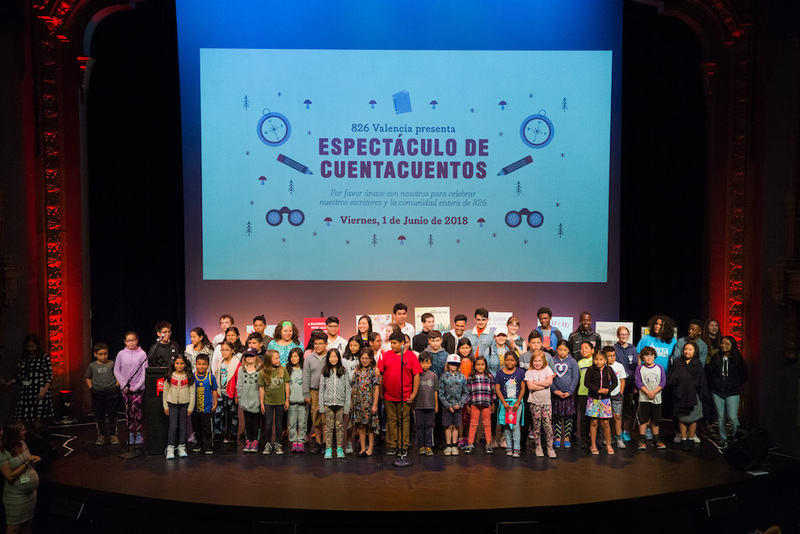 In that festive mode, our community of students, volunteers, families, supporters, teachers, and staff gathered at the historic Brava Theater in the Mission District for our second (now annual!) Storytellers’ Showcase. This mega release party highlighted the 13 student publications we released this spring, including the Young Authors’ Book Project and the 826 Quarterly (in its 26th issue!). The evening was all about our students and their stories with beautiful readings, proud performances, and even some parents’ testimonials. Before the on-stage program, attendees moved through a series of stations in the lobby as part of our Publishing Expo, with activities ranging from “write a letter to your favorite snack” to a “Storytellers’ Red Carpet” where authors and guests answered questions from their fans. The stations were designed and lead by the students on our Youth Leadership Advisory Board, to teach guests all about 826 and what they learned about writing and leadership through tutoring in our programs this year. Other activities, like the coloring book station featuring illustrations from our field trip program, were a hit with guests ages 8 to 80. Needless to say, the room was packed! It’s never a party without great food, so we made sure guests had plenty of yummy options to choose from, including guacamole and quesadillas from La Palma, and decadent brownies for dessert—generously donated by Native Bakery Company. When guests took their seats in the theater, they were treated to student readings that varied from a passionate ode to food to a tearful poem about a war-torn Yemen—stories that were so different in tone and style but equally beautiful and powerful. Once again, our students kept us glued to our chairs with their stellar performances. We were so honored to share this moment with you, our amazing community that makes our work possible every day. Huge thanks to everyone who attended and supported our event and a special thank you to La Palma Mexicatessen, La Victoria Bakery, and Native Bakery Company. We’re already looking forward to next year!